Tule elk are native and endemic to California. There were once 500,000 tule elk in the state but by the late 1800s impacts from cattle ranching and hunting had reduced them to only 28 elk. The news of the deaths of 250 elk comes as the Park Service considers a ranch management plan to either remove or fence in some of the free-roaming elk herds, while extending park cattle grazing leases for up to 20 years. POINT REYES, Calif.— The National Park Service has acknowledged that that more than 250 tule elk died inside the fenced Pierce Point Elk Preserve at California’s Point Reyes National Seashore from 2012 to 2014, likely due to lack of access to year-round water. While nearly half the elk inside the fenced area died, free-roaming Point Reyes elk herds with access to water increased by nearly a third during the same period. The news comes as the Park Service considers a ranch management plan to either remove or fence in some of the free-roaming elk herds, while extending park cattle grazing leases for up to 20 years. Tule elk are native and endemic to California. There were once 500,000 tule elk in the state but by the late 1800s impacts from cattle ranching and hunting had reduced them to only 28 elk. From one surviving herd, tule elk were reintroduced throughout the state and there are now 4,300 elk in 25 herds. Tule elk were returned to Pierce Point at Point Reyes in 1978, and a free-ranging herd was established in the park in 1998. Point Reyes Seashore is the only national park with tule elk. The Pierce Point herd declined from 540 elk in fall of 2012 to 286 elk by 2014, a drop of 47 percent. There are no natural year-round fresh water sources on Pierce Point and the elk in the preserve are prevented from migrating by a large, elk-proof fence. During the same drought period, the free-roaming Point Reyes elk herds — which had access to water — increased by 32 percent. The Limantour herd grew from 94 to 120 elk and the Drakes Beach herd increased from 66 to 92 elk. Cattle ranchers who enjoy heavily subsidized cattle grazing leases on public lands within the national seashore are lobbying the Park Service toremove or fence out the free-roaming elk from ranching areas, because elk are eating grass they believe should be reserved solely for their cattle. The Park Service is considering evicting the free-roaming elk under a planning process initiated for 28,000 acres of leased dairy and beef cattle ranches within the park and Golden Gate National Recreation Area lands in Marin County administered by the national seashore. The Park Service is also proposing extending ranching leases for up to 20 years, and may allow ranchers to expand their operations to animals other than cattle, which would create more conflicts between livestock and native wildlife. There are 13 cows for every elk in the national seashore, with nearly 6,500 dairy and beef cattle and only 498 elk. One-quarter of the national seashore is devoted to commercial cattle operations, with grazing on nearly 18,000 acres under 39 leases. Ten ranching families were paid $19.6 million by the public from 1963 to 1978 for the purchase of ranch lands added to Point Reyes National Seashore. Many of those same families still enjoy heavily subsidized grazing lease rates within the park, paying one-half to one-third the cost they would pay for non-federal grazing land in Marin. The Park Service is required under its enabling legislation to manage the seashore “without impairment of its natural values” and for “maximum protection, restoration, and preservation of the natural environment.” Restoring native wildlife and ecosystem processes is supposed to be one of the primary missions of the Park Service. Elk graze on grasses and flowering plants and also browse shrubs and trees. Unlike cattle, elk move around to take advantage of seasonal food sources. Elk can reduce fire danger by browsing brush that is unpalatable to cattle, without impacts to water quality. Extensive studies have documented the negative environmental impacts of overgrazing cattle, including erosion and soil loss, water pollution, degradation of wetland and stream habitats and spread of invasive plants. Cattle-ranching requires excessive amounts of water — each beef and dairy cow drinks 12 and 35 gallons of water per day, respectively. Accounting for all water use, a typical dairy farm with around 700 cows can use over 3 million gallons of water every day; and every pound of California beef requires about 2,464 gallons of water to produce. Point Reyes ranchers raise the specter of Johne's disease as a reason for evicting the Point Reyes elk. Johne's is a wasting disease of domestic livestock that is spread from confined cattle to wild ruminants such as elk and deer. 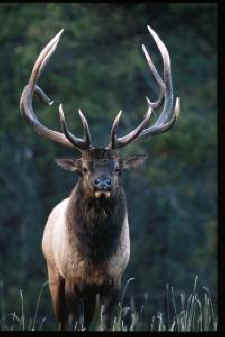 It is documented that Point Reyes cattle infected the Pierce Point elk herd with the disease. The disease takes 3 to 4 years to produce symptoms. By that time, milk production of most dairy cows peaks and they are removed for slaughter, but infected elk begin to waste away. The Park Service reports that more than 200 recent testing samples show no evidence of the disease in the free-roaming elk. Despite previous high rates of cattle infection in Point Reyes dairies, the Park Service does not require testing or reporting of the disease.